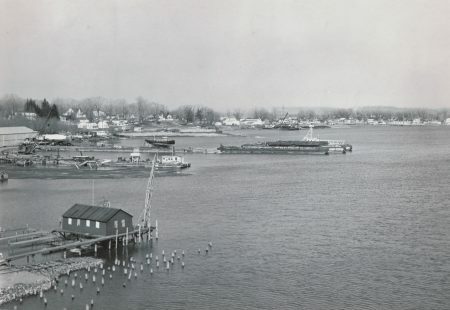 Photo courtesy of Bob Chase, Jr. 1950s photo taken from the coal trestle showing the end of the Kallusch Boat House and the old iron ore dock. Tom Knapp remembers: Suzanna S is the tug on the hard and you can just make out the white super structure of the sub chaser, way to the right, that was kept at Stew’s (Sills)! William Kallusch remembers: The boat house is where my grandfather hung Kid Boots. He built her between 1952 and 56.